So we have had quite a few snafu's over the last few weeks - it's causing a bit of pain with regards to meeting our goal of credit card debt free going into 2013. Jordan was sick one day a week or so ago and he was out of sick time. His manager/payroll person didn't tell him and instead of charging the day to vacation instead (which he has plenty of) - they just docked his pay by 7.50 hours. He's a salaried employee. I was livid. We also have overspent our Christmas budget. Again. Also I forgot that it costs $ to ship gifts. There is nothing like the Christmas season to have giving on the mind. It’s a time of year when there are so many people in need, and we receive so many asks for support. Two years ago, my family created a donor advised family fund to direct our philanthropic desires. Held within the Golden & District Community Foundation (GDCF), all donations to the Principal of the fund are in trust. The Foundation has support from the Columbia Valley Credit Union for above market interest rates – and it’s the interest that is granted to programs within the community that need support. We have found that by donating this way, the money keeps working – and works collectively – to bring more and more funding to our community. After we established our fund within the GDCF, we set a goal of raising $10,000 (the minimum before the interest earned can be used for grant giving). We have just recently reached that goal – and are immensely proud of our efforts. It’s now time to set a new goal, so that our fund continues to grow each year and we can continue to support our community now – and in the future. If you are in Canada, and want to find out if there is a Community Foundation in your town, you can check out this website: http://www.cfc-fcc.ca. If you are interested in supporting my family’s fund through the GDCF, please click the donate now button on the right hand side of this page, and be sure to choose the Crandlemire-Keenleyside Family Legacy Fund from the drop down list. So we had a date with the Bank of Montreal this weekend. Among many things including exploring the line of credit I asked you guys about a couple days ago and a changing my name - we also chatted about our existing car loan. The payment frequency used to be every two weeks, just under $195. It was a pain, because we bought the vehicle on a weekend, so the payments always came out on Monday or Tuesday rather then the Friday - and once and a while there was three payments - I didn't keep track well which months because it's the Mondays rather then the Fridays. All that said - we changed our payment frequency to $100/week rather then $195/two weeks. 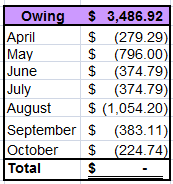 Annually, our payments have increased from $5,052.06 to $5,200 - not a huge change at all - but the payments now align with our mortgage and I like round numbers. We have been offered a $10,000 line of credit with the Bank of Montreal because of our good history with our auto loan and credit card that we have with them. They are offering us a really reasonable rate (less than 4%), no credit check and it would be unsecured. We're very interested because of the work were planning to do on the back yard this year, we were planning on having to use the credit card a bit as we saved up money (we won't have the $10,000 for the yard technically until December, 2013 so were planning on using the CC and then paying it off as we saved the $$). A line of credit with such a low interest rate would seriously help with the interest for next year's back yard project. All the tracking bars are updated with the 2013 goals and current balances! Question - does anyone get a Christmas or annual bonus/profit share this time of year? If you do, how do you manage where it gets allocated? Today I just wanted to share a quick credit card update. Jordan and I are still on track to get the card paid off by the end of December!! Last week Jordan and I went out for a budget date - Vietnamese soup - so it was an inexpensive budget date. I really like saving for everything at the same - money going into each 'pot' each week, so that you can see the progressive growth overtime. Jordan likes aggressively tackling one goal at a time. Such is life, we compromised. 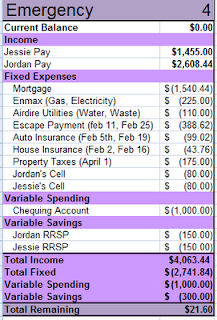 We are going to continue to make weekly RRSP contributions, while we aggressively tackle one (other) goal at a time. We're going to save for each of these goals in order - it was easy for Jordan and I to agree that our emergency fund was the number one priority and the past $1,000 we maintained was simply not enough. Following that is our Vehicle Maintenance/Emergency Fund - we're planning on buy a second set of rims in the summer when we switch our tires back from winters to all seasons. That will save us about $200/annually on switching and will extend the life of the tires/rims all around. Our camping/vacation fund is seriously lacking this year. Under some protest (by me), we decided that we just can't have it all - and trying gets us into trouble. So we won't be going on our two annual week long camping trips this year. Instead, we'll hopefully have some long weekends and staycations. Next are our gift and Christmas funds that Jordan wanted to separate - we never save enough for these, and want to do better this year. We will reach the first 5 goals by the end of May. Check out the 2013 Budget Page to see the budget breakdown. Last for 2013 is the House fund - and all remaining cash flow will go into that account. We are going to be building a fence, installing the grass, building a dog run and a deck - and biggest of all - a garage. Within our current budget, we'll save about $10,000 - so we have to find ways to come up with another $5,000. We've got some ideas for that - but I'll share those in another post. 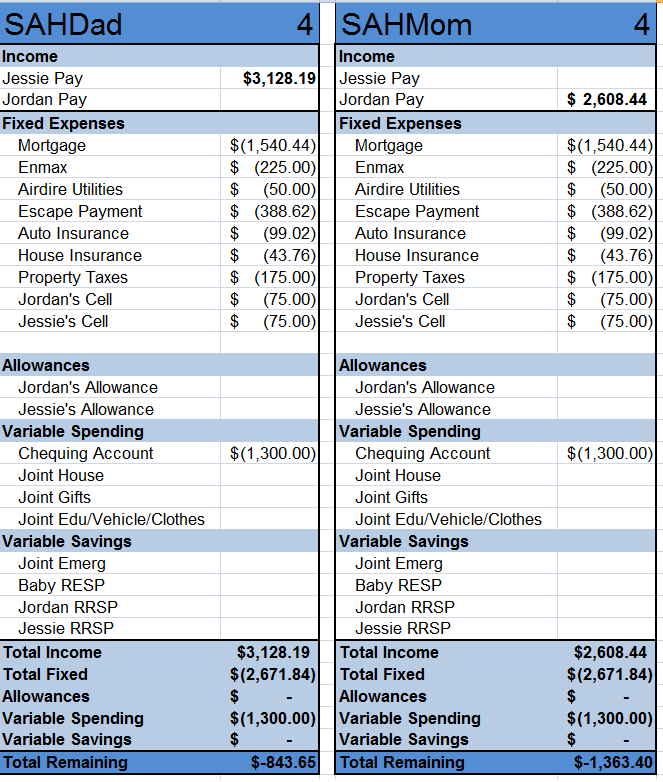 I had a look at our baby budgets again after considering Jordan's raise, and we can actually now survive without additional savings or income with Jordan's salary and me on EI. There wouldn't be extra's - but it can be done. So, that's on hold. Getting the yard done is the last big thing that Jordan wants to do before we start a family - and so I really want to support us getting that done so we can start our family together with both of us feeling strong and confident about the decision. 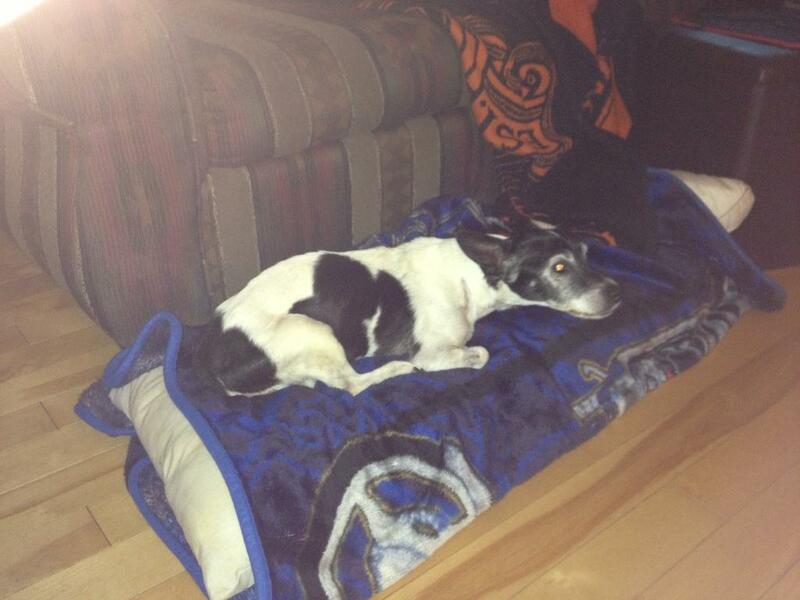 Yesterday morning, our family dog of the last 14 years passed away peacefully. My mom let my brother and I know straight away and it was so very difficult for us to all be in different cities - provinces too actually. I'll be going back home in three weeks to visit - and it really just seems so far away. There has been so much loss, heart ache and upheaval this past year. My heart needs time to heal before I can manage any more life challenges. My family needs time to heal. Never have I, nor has Jordan, experienced what we did this past Friday. I mentioned in my last post that we knew the second part of his raise had finally been approved albeit six weeks late. We weren't actually expecting it to be processed so fast - but it was - but the real surprise is how much it was. I pride myself on being able to run the numbers and figure out within about 10 cents what our net will be when we get a raise - and I was off by quite a bit. 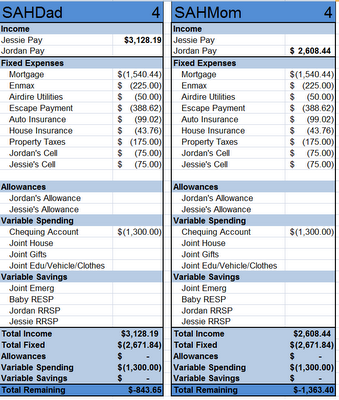 When I got to my spreadsheets I realized that Jordan didn't get a raise to $50,000 he got a raise to $51,600. He's salaried - but for hourly folks that's a difference of $24.04/hour vs $24.81/hour. Gross Monthly it's a difference of $166/month vs $300/month. At the end of the day Jordan will take home an extra $33.63/pay or $874.38 over the course of the year. So we got a random deposit of $500(+) from Jordan's insurance provider this morning - that's fantastic because today our weekly mortgage payment also came out. We have looked into a few other things we can do to help with the bit of shortfall, and still meet our goal of paying of the credit card. When we have a bag full of recyclables we toss them in the back of Jordan's truck (it has a canopy and isn't driven much). We haven't gone yet (but hopefully this weekend) - the truck has half a dozen black garbage bags full - I'm crossing my fingers for about $50-$75 there. With these three methods - we've almost found the $300 shortfall!! What strategies do you have to find more money when you have a shortfall or unexpected drop in income? (other than your emergency fund, which I know, I know, we need to get funded again). So yesterday we found out that Jordan was actually only paid for 6 days at full time for the days he was at work before he went on short term disability. The insurance company, will pay him separably for 80% of his pay for the 9 full days that he was off work. Jordan also found out yesterday that the rest of his raise is FINALLY approved. So I'm not sure if his STD will get paid at his new salary or his old salary and no one really seems to know the answers. I had a look at the budget and realized that over the next few days we were going to wind up in the overdraft pretty badly - so I transferred my allowance money ($702) into our joint account as a buffer. For those folks who remember, yes we stopped giving ourselves an allowance, but I still had some cash stashed away. I was planning on using this money for a pretty day bed for my craft room - and hopefully will still be able to once we get the disability money and Jordan's raise comes through. So..Jordan had emergency surgery two weeks ago to have his appendix removed - he went from mild discomfort to get that thing outta him in about 14 hours. He's set to go back to work on Monday - but didn't have enough sick time to cover the two week period. We applied for STD through his work benefits program and was approved. Thankfully, his program didn't have a waiting period. Unfortunately, the benefit is only 70%. On top of that, the second part of Jordan's raise STILL hasn't gone through. Which means he got 70% of $48K not 70% of $50K. Needless to say - my whole budget is out-of-whack. We're $500 short on his regular pay plus another $200 short because of his raise. Guess who's credit card is not getting paid off in time for Christmas. I did have a bit of a buffer with cash flow in December - but we're going to be $300 short...and that assumes that Jordan's raise will at least go through for December..only two months late. It's the time of the year where I get to do one of my favorite things - make the 2013 Budget! I know...what a geek! But what did you expect on a personal finance blog?! 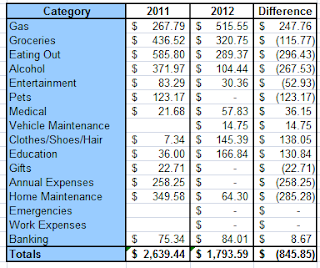 The image on the top shows the average variable and total variable spending for each category that we track. This is going to be helpful when we look at how much we need to save over the course of the year for each of these items. I knew we spent a lot on gifts around Christmas - but wowza! We spend a lot throughout the year. Emergencies is probably not realistic either - during family emergencies - and I've had a few this year - typically we spend more on gas and eating out - so the day-to-day spending takes a hit when that happens. Education and Banking shouldn't be an issue for 2013 - our credit card will be paid off by Christmas and neither Jordan or I are planning any further education in the coming year. A month ago, Jordan and I increased our day-to-day, weekly spending allowance from $300 to $350 after we realized that we were using our credit card again to supplement things when we ran out of $ which was making it difficult to both stay on track and pay of the credit card. 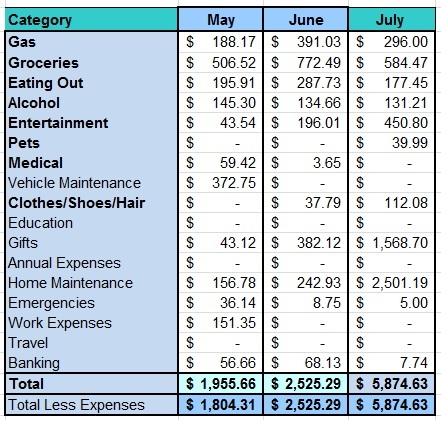 You can see - that we still have some changes to make - because on average we spend $1,848/month which is $331 more than the $1,516/month we give ourselves (on average - I've spread the 'extra' week we get four times a year over a 12 month period). It's no wonder we tend to hover with a credit card balance around $3,000 - - - $331*12 is $3,976! I would like to keep our planned day-to-day spending at $350/week - and hope that if we actually pull emergency gas/eating out/travel - and use the emergency fund rather the day-to-day or credit card when the ca-ca hits the fan, that we'll be closer on target. Jordan and I were also taking about groceries and waste and we both believe we have some room to improve their - we through out way to much food after it spoils. This is what I'm thinking for our 2013 plan. I haven't reviewed it with Jordan yet - but he reads this blog - so it's all open to change. I tried to match up with what we did last year, as well as consider any changes - I don't think this Christmas - or any really - going forward will be as flush as they have been - and with some other recent changes in my life - I don't imagine we'll be spending as much as we have in the past on gifts. Home Maintenance spending will be supplemented with Tax Returns and any gift money we receive throughout the year. Yes - I want a Baby Bank - No, I'm not pregnant - I want to start saving for whenever in the next few years we get pregnant and have leaves of absences and what not to contend with. Last but not least, let's look at the potential monthly spending plan as a whole - I've made so many changes to this over the last six weeks that I thought it best just to put it out there to get feedback. 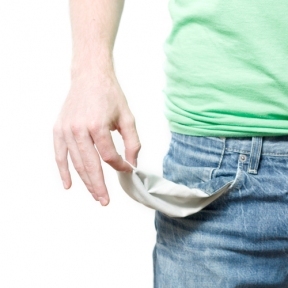 Fixed expenses are just that - they don't typically change. Allowances - they are on hold right now but the intent is to start them back up again in the new year. Variable Spending - this should match the 2013 plan I posted above. Long Term savings is pretty consistent with last year except I want to increase Jordan's contributions by at least $100. I would like to see this at $400 - but I'm not sure where to take from to make that happen. Just a note that I've updated my Mortgage, Ford Escape and Christmas tracking bars. We actually own 2% of our house!! Somehow that's more exciting that owning 22% of our vehicle. Today's post diverges from the typical. Today I'm asking for a favor. Through the AVIVA Community Fund, my little hometown is trying to win a competition that would bring funding for trained medical staff to visit our community twice per month to enable them to provide cancer related treatment/services to those in need. Currently, there are no qualified professionals in Golden, BC to provide the care that cancer patients need which results in significant travel and expenses for their families. This initiative is very close to my heart as my father has recently passed away from cancer. He suffered from a heart attack after battling lung cancer for a mere six months. During that time my family had to drive three hours (approximately) to the nearest cancer treatment center; often staying overnight at hotels or having to turn around and drive another three hours back home after the treatment. Bringing training to our local hospital so that our nurses and doctors could provide this support/service to residents would impact the lives of so many people in this rural community. To vote, you have to register (and I apologize for that, I assume it’s to avoid spam voting). You can register with an email address or with your Facebook account which is quick and easy. We are currently in the first qualifying round of the competition for funding. You can vote every day up until October 15th - if we make it to the second round we can continue to vote. Please consider taking a few minutes out of your day to explore this competition and vote to bring Chemo to our Community. I was talking with Jordan yesterday about our financial picture for the last quarter of the year and because we haven't talked about money for quite a while - we covered a lot. In the beginning of the year, we set aside money for summer vacation, some travel and emergencies. Since that time, we've spent all that money...and then some. So it was a good idea to set that money aside, but we didn't forecast very well. As Jordan just said yesterday, 'the summer happened'. So, Jordan and I have made plan to get back on track before Christmas hits. We had talked about increasing our day-to-day spending weekly allotment once the card was paid off, but our sense is that it's not getting paid off because we're using the credit card to help supplement our day-to-day spending. The theory is that we'll use the credit card less because we're giving ourselves a bigger spending budget - in the meantime we'll cancel our allowances (which neither of us have been spending much of lately) and re-direct that to our credit card. On another positive note, our automobile insurance just went down - woohoo! Jordan is absolutely thrilled to share that his Visa has been paid off - and this time - he's going to cancel it. He's been using his personal spending allowance to slowly but surely pay it off. A few birthday and cheques had gone towards the debt too. Once the final interest accrual is posted, he'll be calling the company and calling it quits! Now that we caught up on Friday with the last three months of spending - I'd like to update you on our year -over year tracking. 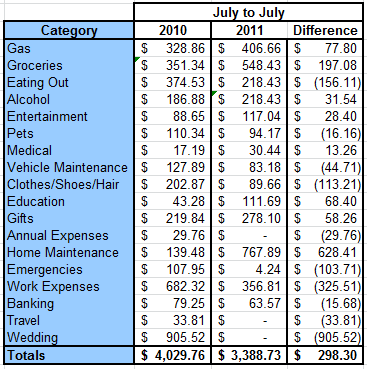 Below is our average monthly spending from July 2010-July 2011 then July 2011 to July 2012 and the difference thereof. It looks like our battle to eat out less is winning - however our grocery bill has more then ate up what we were saving - this is a really interesting trend. With regards to alcohol - that went up a bit - but I'm satisfied that this is reasonable considering how often we buy wine as gifts but I often track it here rather then in the gift category where it belongs. We're spending more on home maintenance, but this really doesn't surprise me. Now that we're settling in to the new space - and slowing buying furniture and what not - I expect that this will continue to be a top line item in our budget for a while. I'm pleased that we're not spending as much on emergencies however; this unfortunately doesn't mean that we've had less of them - just that they've been closer to home this year. I believe that we still have a bit of work to do when it comes to managing how much goes in our mouths - but perhaps we take a cue from one of my aunts and look at how much we buy in terms of groceries and how much gets wasted and/or thrown out. We often buy way more then we need and then in spoils...there used to be some once a week photo captures of the weekly food toss people were doing - I might see if anyone still does that and join in - maybe the visual would help. The categories that are in bold are that which our day-to-day joint spending account are for - the account that we give ourselves $300/week for. The other categories are typically saved up for before purchasing - or purchases we've been able to make because of, for example, birthday money/tax returns/ ect. While groceries continues to feel like a lot for two people - gas has finally leveled out which is good. Our eating out is fairly high as well - but nothing like it used to be in years past - the same goes for Entertainment with just one splurge in July. Education has leveled off because Jordan and I are (for now) currently both done with our most recent educational pursuits. Home Maintenance also includes large 'for the home' purchases - furniture and that sort of thing. We're still settling into our new home, so I imagine this line will continue to see fluctuations. Jordan and I are both so very excited to share that he completed his Journeyman Parts Technician program. He took that, along with the last four years of yard work and dedication to his boss and asked for a raise - and he got it! He's going from $44,400 to $50,000. It's going to be a two part raise - the first he's already received, so he's up to $48,000 now and in October, he'll get the last bump up to $50K. I've already started playing with the budget to see where we can but his raise so it does the most amount of work for us - but we haven't decided on anything yet. Quite a bit of this is the same as always - bills listed under fixed expenses (Mortgage, Utilities, Car payment, insurance, taxes, cell phones ect). You may or may not recall that Jordan and I have two chequing accounts. 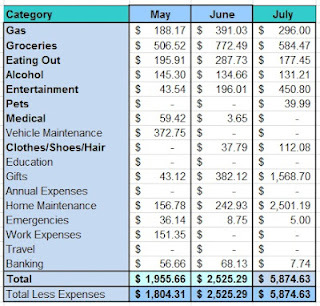 Once is for all of the above mentioned expenses, and the other is for our day-to-day spending - things like groceries, gas, haircuts, clothes ect. It's like our 'jars' but it's one pot attached to a debit card. That's the monthly spending line. It's been $1,200 which has felt pretty tight - often leaving us reaching for the MasterCard if we take a single extra trip outside of driving to and from work - needing gas money. 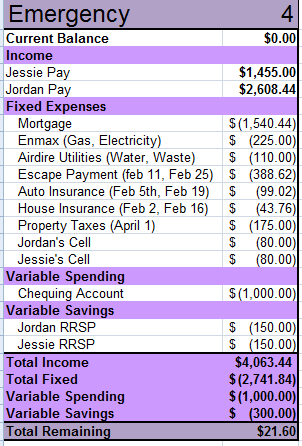 I think $1,600 is probably too much to start with - but I was just playing with numbers. Anyways - personal allowances are the same. Changes are in the variable savings items - including a baby bank, emergency fund, house fund and RRSPs. I have a pension at work that vests this October (they match 5% of my salary) and Jordan does not - so fr that reason, I think we should start putting more towards his RRSPs than mine. As always, if you have any thoughts - we would love to hear them. There's been a lot going on in my life over the last five months and it's been difficult to prioritize anything for myself, let alone my blog. The worst of it some of you have picked up on from my cryptic posts and I can't actually type it without crying- so I won't. In addition to that, both my Great Aunt and my Dad's Mom are now in assisted living facilities in different provinces which involved a tonne of prep work and energy by the entire family to get them situated (my grandmother still not done yet). It's for the best though, and we're hoping that they're enjoying their new spaces. My best friend and I had a huge falling out - she's been struggling with the way I'm coping with things and a significant absenteeism and commitment problem on my part. We're going to get our nails done tonight though, so things are hopefully going to get better on that front. July was hectic in and of itself - we have my birthday, my mom's, Jordan's mom's birthday, Jordan's birthday and his brother's birthday - not to mention the birthday's of two uncles and another cousin. We did a lot of birthday dinners and party's - but for mine - my mom and I went camping. We just got back from our trip actually - we had no cell phone or internet access for a full week which was magnificent. There is still a tonne of busywork on my horizon, but I'm hoping to start writing more often again - I don't know about the rest of you, but my mom misses me when I don't. I receive a monthly email from participating in a crucial conversations workshop. Normally, I read the letter, which often has tips and advise, delete it and carry on. Today's email is very relevant to me and my family right now and I would like to share it with you. You can also read it online, on the Crucial Skills blog. There are a lot of links and what not in the original article and I've left them intact for your reference - this isn't a sponsored post - it's a copy & paste of one I really enjoyed. My husband recently passed away, and although I’m sure they don’t mean to hurt me, several of my friends and family members have made insensitive comments about my loss or the way I grieve. For example, people have told me, “It was God’s will,” and, “It’s time to get on with your life.” I know it’s hard to know what to say in this situation and I know they are trying to help, but I don’t know what to say when somebody belittles my pain. How can I respond to seemingly insensitive comments about my husband’s death? I’m so sorry about your husband. I’m especially sorry that the pain you’re feeling has been compounded by others’ actions. I wish I could help with the first problem, but I hope to offer some helpful ideas for solving the second. I wanted to offer meaningful advice, so I asked our 180,000 newsletter readers to share their perspective. I read through pages and pages of their wise and heartfelt comments, and I’d like to share a summary of the recurring insights, allowing many of our readers’ caring voices to speak to you through direct quotes. What do people want when they’re grieving? What should you do when people say or do things that don’t help? 1. What do people want when they’re grieving? They want your heart, not your brain.Too many times, we avoid those in pain because we aren’t sure what to say. We think we need soothing poetry laced with wisdom of the ages to spill from our mouths in order to soothe their pain. Don’t wait for inspired words, just make contact, grieve alongside them, and share the moment. Don’t avoid the grieving person because you don’t know what to say. “I’m sorry for your loss” is enough. Your mere presence is enough. I don’t remember anyone telling me it was okay to feel sad or lost, or to hate what breast cancer did to my mom’s little body. It would have helped if someone allowed me to grieve. Simply asking how he or she is doing and saying “I care” goes a long way. When my husband died fourteen years ago, it was helpful to me when friends called and left messages to “check in on me.” I would come home from work each night and just listen to the love and concern of dear friends. I felt no need to call back; I just listened. When someone I love is going through shock and pain from some precipitating event (like death, job loss, etc. ), I put a reminder on my schedule two weeks, two months, and six months out. People often get a flurry of support close to the incident, followed by a long quiet time. I find that going to lunch with them in these intervals allows me to be with them at times when loneliness or self-doubt can be most profound. 2. What don’t they want? They don’t want judgment, repetition, or assignments. If you’re not careful, you can respond similarly to those who have experienced the death of a loved one. We want their pain to go away so we can reassure ourselves that we can avoid pain as well. So we offer advice on grieving, judgment to help them put their pain “in perspective,” etc. Be careful, because when we feel a need to make these kinds of comments, it’s often more because we want to restore our faith in a “just world” than because we want to soothe our friend’s pain. Many reader comments complained of friends who offered judgment or unwanted advice rather than providing a simple connection. My mother passed away last year after a fairly long illness. I struggled to get her the care and attention she needed while still managing my own life and career, so I hated when people I encountered said, “Why don’t you just do . . .?” On several occasions, I thought I was going to come over the table at the next person who authoritatively asked me why I didn’t do this or that to deal with the situation—like I was too stupid to think of the most basic, obvious solutions. When I lost my seven-month-old daughter, I didn’t want any religious speech about how she was in a better place or that God had a plan for her. I just wanted (and still want) people to grieve with me. At my father’s post-funeral luncheon, a friend told my stepmother that she would find herself dating again before long. I could hardly believe the insensitivity of the comment. My stepmother has struggled to forgive this person and realize it was an awkward attempt at helping her remember that in time, the pain will subside and life will take on a more routine feeling again. Secondly, people don’t want you to force them to review the facts of the case for the hundredth time. They also might not want to give you an emotional health report. Be aware that asking, “So what happened?” or “How are you?” can put a burden on them. Finally, don’t give them an assignment. When we’re at a loss for what to say we often end with, “If there’s anything I can do for you, please let me know.” If you really want to do something, think. Stop and think about everything you know about their life. Where do they live? What little chores do they have to do to make it through a day? What extra tasks will now fall on them because of the loss? Empathize as best you can until you find some proactive task you can do to communicate real compassion. It won’t matter if it’s the perfect idea; it just matters that you take initiative rather than assign them to involve you. They rarely will, so the offer rings hollow. I so appreciated those who just did things for me and didn’t ask me to “give them a call if I needed something.” Most of the time, I couldn’t think of what I needed or didn’t have the energy to make the call to ask. 3. What should you do when people say or do things that don’t help? First, be proactive. When you know you’re feeling very sensitive, tell people what you do and don’t want. One wise father avoided a whole lot of hurt feelings by just making it safe to grieve and feel differently—and encouraging his kids to let each other know what worked for them. The most common piece of advice was to Master Your Story. Realize as you grieve that even those who make annoying comments are trying to deal with real emotions—yours or theirs. Let them be imperfect. I don’t hold much store by what people said. Honestly, it’s only words and it’s often a sign that people feel awkward. It’s silly clinging onto words when none of it matters. Dying is part of life and none of us have the answers for doing it gracefully, we just have to get through it the best we can. When others are insensitive, don’t take it personally. Try to understand that they don’t mean any harm. They just don’t know what to do. Make this the new story you tell yourself. Finally, if you need to give others boundaries in what they say, do it quickly before you build up too much resentment. It’s perfectly fine to politely, but firmly, let people know what you don’t want. My mother died recently. While we weren’t particularly close, I loved her very much and miss her dearly. Every time this subject came up in a conversation with my boss, she would say, “I know you weren’t very close to your mom . . .” It was time for a crucial conversation, so I asked to meet with her. I expressed to her how much I appreciated her support through my bereavement. I then asked her if I could request something of her that would be very important to my healing process. I said, “Could you please not mention that I wasn’t very close to my mom. I know you mean well, but it makes me feel bad and right now I want to focus on the good parts of our relationship.” It was a great lesson for both of us. Thank you for raising this question. The pain you feel right now is universal. You’ve given all of us a gift by sharing the question at this tender time by letting us think about ways to offer greater and more useful love and support during one of life’s most poignant experiences. We compiled many of our readers’ wonderful and helpful comments and would like to share them with you. Please visit us on Facebook to download our free e-book, How to Talk About the Loss of a Loved One: Dos and Don’ts of Comforting Others. Quite a few of you know that I was pretty excited to get this post put together - it's a quick one, but powerful. 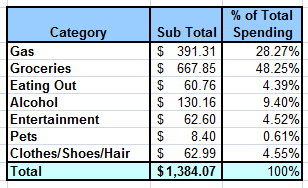 This is the first monthly spend summary where Jordan and I were spending money according to our New Plan. It's the least we've ever spent since we started tracking money. ...in the last 22 months. AND - Jordan and I even made and addendum to the plan which includes an extra $300 every 3 (or 4) months to top op our pantry and do any bulk shopping that we need to do. This was the least stressful month I think we've ever had and the least expenses. Crazy. When Jordan I merged our finances a couple years ago, we maintained our personal chequing accounts. We thought that it would good to have some money available each month that we were only accountable to ourselves for – that we could spend without checking in with our partner. For the last couple of months or so, Jordan has maintained that he would like to eliminate our allowances from the budget. He had thought that in efforts to simplify things, and stop over using his credit card – this would be the best solution. I’ve been…hesitant, but unable to really explain why. I suppose, it was to uphold the original intent – to have money that we’re not accountable to each other for. I had hinted in my last post – that once our debt was paid off again, Jordan and I would continue the allowance conversation to see where it took us – and that if my needs of family vacation/camping ect. were met – perhaps I didn’t need an allowance any longer. Since reading my last couple of posts, and Jordan and I continuing to make positive headway in the way we have our conversations – I asked him a question. It was simple really, on our drive home from work. “so, in November – when my aunts and mom come to town for our annual Christmas shopping trip – where will the money come from that I spend on myself?” While I start on our Christmas shopping then (and we have a budget set up for that), I inevitably spend $200-$500 on myself. This could be for clothes, undergarments, buying lunch or dinner – or all of the above. He went on to say that in one of our previous conversations, he had admitted to feeling like he couldn’t spend any of our joint money without checking in – so he winds up using his credit card for both personal and home purchases. He hasn’t had that feeling since we started spending money according to the New Plan, but said that if we got rid of the allowances – then we’d be right back there. Where we have to check in for personal expenses. So – I asked. If we don’t get rid of allowances and personal credit cards – how will we help you to not spend more money then you have by way of your credit card. He said that he would still like to cancel it – as soon as the debt is paid off. That way, he can just take out cash. He still wants to be able to buy a video game or whatever using his ‘unchecked’ allowance. That means - allowances are back on. With that said, our conversation moved to new territory. How much should our allowances be. Way back when, when we set this system up – we had decided on $100/month. It sounded good – but we didn’t have a real good reason for that number. I thought I would through it out to all of you, to the couples that organize their finances jointly, but have allowances. How do you do it? How much do you get? 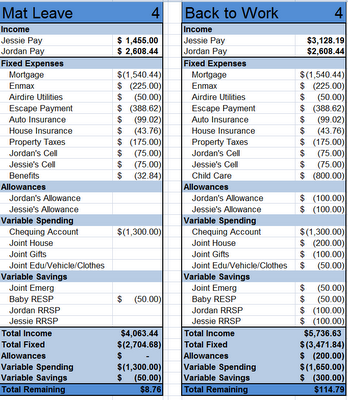 After finishing yesterday's post, we updated all of our spreadsheets and numbers to account for no more auto-debits to our emergency and gift funds which meant we freed up some monthly cash flow to go towards our credit card debt. We also decided to put the $500/month towards our 'house fund' on hold until the debt was paid off - which freed up a lot more cash flow. The last time I posted on this we were looking at November. We've shaved off five months - great news! When Jordan and I were talking on Monday evening, he admitted that he had been feeling like the money in all of our savings funds were 'off limits' - he felt like he had no say and no access to that money. I on the other hand, feel freedom and safe when we have money tucked away - so that it's their if we need it. We both actually want the same thing: flexibility - but have fundamental different ways of going up getting it. From there we talked about our credit card debt a bit. He mentioned that his card had a balance of about $850 on it - $300 of which were for repairs for the truck that he didn't want to use the credit card for (the joint one) and didn't feel good about talking about it. He also has felt like he had to use his card as a buffer - even for normal day to day spending. That said, he hasn't touched it except for a Valentines day gift for the house since we started our new spending plan - which we both feel a lot more comfortable with. So, we have committed $300 from April's budget to go towards his credit card for the truck repairs. We're also going to continue the conversation on our allowances and if we still need them. Jordan feels strongly that if we didn't have an allowance, he wouldn't use his card and would even rather cancel it and just stick to the joint account. I tuck my allowance away to help pay for clothes that aren't 'needs' and guilt free purchases for lunches with friends sometimes - but if we find a way to build that into our regular spending, then maybe we don't need them anymore. Sometimes they don't change very often, sometimes they do. Sometimes events happen in our life that have us call into question the path that we're on and require some thought about the fork in the road. 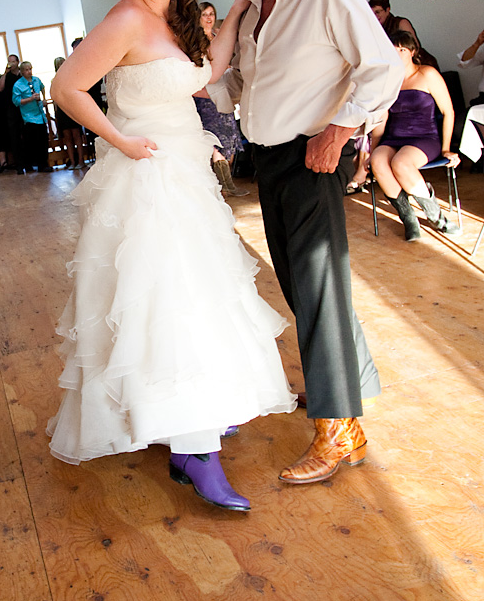 It has been ten weeks since my father passed away. Jordan and I have had some pretty big plans in finishing our house, including a garage, fence, landscaping, deck, basement development ect. - all really big things. While I still want those things, I no longer feel the need to have them done right this minute - at the cost of our debt load and financial and personal well being. What I want now, is to spend as much time as possible with my family. With Jordan's family. What Jordan and I both want is some calm, some steady peace in our financial house. We want to be able to go on a trip with friends for a weekend, go camping with family and not worry that we can't because we've got this garage we're building (or whatever 'big project'). We also want to enjoy our house and our space with said family/friends. So, we've adjusted our priorities. If you've been following along in our growth over the last few years, you've seen that typically we save for a number of different things at one time. Sometimes, as many as six or more. This puts some pretty long sights on all of our goals and means that we don't have to prioritize them if we focus on all of them at the same time. There's a few things that happen every year: Christmas and Camping - so, doesn't it make sense to save for those right away in the beginning of the year? We've moved some cash from our 'house fund' into those funds so that they are done. We've met two goals already and that feels great. We also know that we want at least $1,500 in our emergency fund (about one month on EI if anything were to happen) - so, we moved some cash from our 'house fund' into our emergency fund and that's a third goal that we've met. I then moved $500 to add to the debt pay off for this month and kept $1,000 in the house fund for some short term items around the house that we want. Now that we've reached three goals and have the ability to get some things done around the house with out the weight of a garage weighing over us, we don't have to keep contributing to these small goals - so i'll be cancelling those auto-debits and adjusting the budget. That also means that we can pay off our debt sooner. Much sooner - but more on that tomorrow. 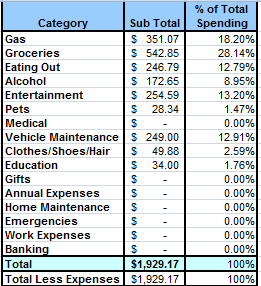 So it's a little late, but here is the monthly spend report for March. March was the month that we transitioned to The New Plan so about half our spending was on the credit card, and the other half was using our new debit card system. This is the least we've spent on gas in quite a while and the most we've eaten in quite a while too! To be honest, I'm not very excited about this post - I'm really excited to share this month's with you in a few weeks b/c it will be the first full month with the new cash management plan! So a weird thing happened this week. Jordan went to the place of forecasting, guessing, planning, and 'what ifs' and I went to the - I want to work with facts place. That is so opposite to most of our conversations. After we realized what happened, it was an eye opener in understanding how the other thinks/operates most of the time - which was great - but that learning is not really what this post is about. The conversation was what our financial picture would like like after babies (no, I'm not pregnant - but yes, we plan on a family one day). Jordan and I both support the idea of one of us staying at home, and while I really want that person to be me, financially I never thought that it was realistic. Jordan is actually really keen on the idea of being a stay at home dad and while that sounds great, there are some perceived risks associated with that too. Someone brought it to my attention that while financially it doesn't make sense, it might be harder for Jordan to re-enter the workforce after taking a few years off to raise children. There could be a perception that he stayed at home because he 'couldn't' find work - or some other BS. I showed off my spreadsheets to Jordan tonight, and he asked me to share them with all of you. He really wants to know 'how you do it?' - how do you have kids and maintain a household at the same time. So here it is - first the mat leave budget (including EI (but not my salary top up) - for the first 15 weeks i'll get my Employment Insurance topped up to 70% of my base salary from work). Beside that, you'll see our 'back to work' budget. We don't have family available for child care - so we called around and took an average price on what seems to be child care options in our city/neighborhood. We kept our variable spending in our chequing account the same as it is now because we figured while we'll spend less on some things (alcohol) we'll spend more on others (diapers). While it would be tight - super tight - I'm actually re-assured knowing that if I did get pregnant, we could still pay all the bills. We also talked about saving up to have a 'baby bank' to top up our income when I'm on leave - using savings on a monthly basis to 'top up' our own salaries. We obviously can't consider either of these scenarios unless one of us gets a HUGE raise, we pay off the Escape, and get a side job on top if it. So there it all is - what do you think? How do your family's do it? It's that time of year again at my company and I'm pleased to share that I received a raise. This year, I moved up 6.8% to $63,000 (I was at $59,000). I'm really quite satisfied with the increase and feel as though my contributions to my team and my company have been recognized. In a time where many people aren't receiving increases (still! which I think is crazy! ), I was a bit hesitant to share the numbers - but Jordan and I are really pleased plus it means an update to the budget once again (we're crossing our fingers that he'll see an increase this summer as well). 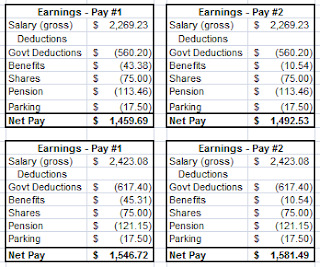 The first two boxes are what may pay was (bi-weekly) based on $59K the second two boxes are based on my bi-weekly pay at $63K. The net increases is $175 and some cents (no I didn't share the math for the two months where there's three pays, but it would basically be the same w/out the benefit deductions). A few weeks ago, I wrote about The New Plan and the Credit Card Pay Off Plan and I thought it was time to update you on how it's going. The New Plan is in full swing and it's working. ING Thrive was a bit of a pain in the a$$ but seeing as how they wouldn't allow for two joint chequing accounts - we've had to just get a single chequing that we're sharing one card. I was a bit apprehensive, but we didn't want ING to stand in our way of trying out this new way of managing our spending. Jordan and I are together most of the time - so it's been fine sharing the one card. I'm finding that I'm already much more relaxed about impromptu spending, because I know that all the bills are safe in our joint account - the spending account has only one job - spend. We've been getting gas/groceries on either Friday after work or Saturday and once that's taken care of, it really doesn't matter what we spend the rest on. If we run out, we run out. We have - a couple of times - but it wasn't a big deal because we knew that on Friday we'd get our $300 again and be just fine. The Credit Card Pay Off Plan is working as well. We've actually even shortened the timeline by a month already. I got a raise and also have forcasted when we'll reach our EI and CPP maximums this year and have allocated the extra cash to the debt as well. So while I haven't been very inspired to write much lately, we're on track and that's a great feeling. We currently owe just over $4,500 on our credit card..again. 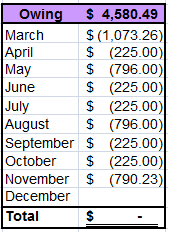 Below are the months for the rest of the year and the debt pay offs that we're committed to each month. Regular months, with four pays, will see $225 payment. 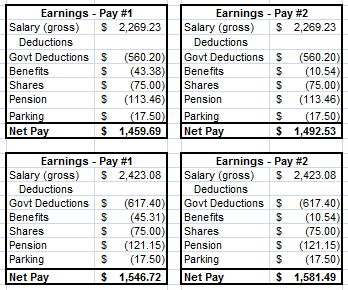 Months with five pays will see a payment of just under $800 and March sees the largest payment because on top of being a five pay month - we also received a payment from our shares at my work. What's different this time? If you missed it, go back a couple of days and check out The New Plan. The biggest differentiating factor this time is that we actually won't be using the cards at the same time. I'm not sure if I'll be able to continue to do my month spend tracking - but i'll give it a try using the debt card/tracking receipts a bit better. It's been white a while since we've looked at our emergency fund goal to ensure it realistically fits our current lifestyle. Our worse case scenario for us financially would be a job loss - given that my income is a bit higher then Jordan's - in figuring out how much we need in our fund, we'll assume that I lose my job. I've done some reading online and come up with a reasonable employment insurance income (less taxes) so we wouldn't be on one salary necessarily. The analysis below, also assumes no credit card debt (which we won't have for much longer if you saw yesterday's post). Jordan isn't sure he wants to continue having allowances as it is - so that's the first thing to go in our 'emergency budget'. The next to go are our joint house and joint gifts account - these are two of our variable spending accounts - intended for larger purchases. The next to be cut is our emergency fund - if we are withdrawing from it - there doesn't seem like much point to be contributing to it. 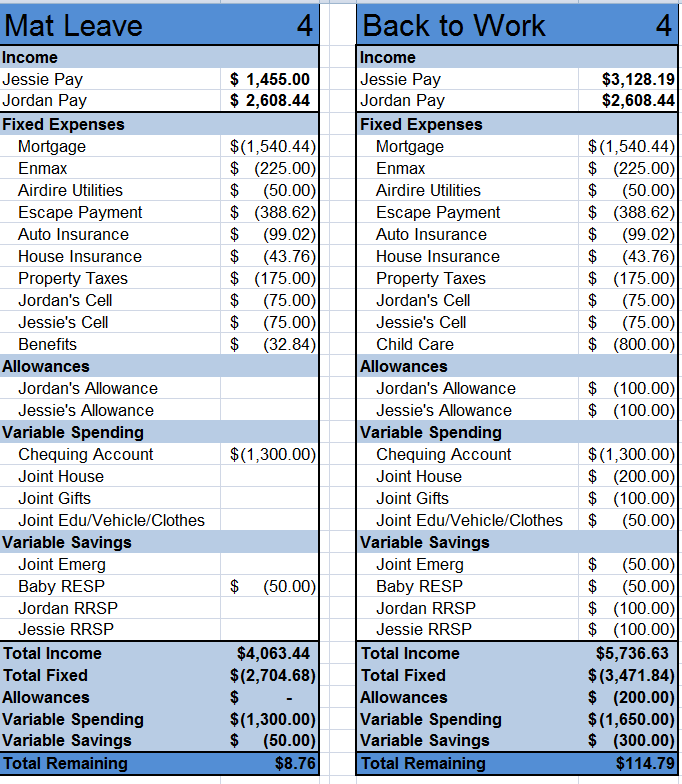 The next step is hard...I hate touching RRSP contributions...even in an exercise like this - but it's got to be done. RRSP contributions are reduced from $200 to $150. Wow! I'm pretty surprised - but it looks like we could handle this scenario and still be okay. We wouldn't be having much fun, but we'd be okay. I think that it's important for us to remember that while we could handle a job loss as long as I had EI benefits - there are often delays in securing said benefits. There may also be an instance where we wouldn't qualify for them. There may also be a time where neither of us loses a job - but we need to take some time off. We both have benefits - but again - there may be a time where we have exhausted our benefits and still need to be away from work for a period of time to support our family in one way or another. I've always been comfortable with $1,000 buffer - I know, I know - it's not three months or six months expenses, but it's always worked in the past. Now that we have a mortgage payment, I'm not so comfortable with that line of thinking. I think that a one month buffer would be $1,500 (based on assumed EI earnings). I would like to see us end up with say, $5,000 in our emergency fund - perhaps held in a TSFA or some such thing - but for now, $1,500 feels like a good number to reach for. Once we're there - I think we will probably increase the goal in increments of the same. ...we are both on the cusp of raises again and are expecting a significant change. I wanted to have a look and make sure our budget actually reflects what we do - not what we want to do or think we ought to do. While I like to project and think into the future, Jordan likes to wait until we have actual numbers - the facts. Jordan wants us to stick to our spending plan - and not just increase the budget because we can't seem to get a hold of ourselves. We've never been able to construct a system that would prevent us from using plastic. then...a couple of days ago Jordan and mentioned wanting a pressure washer so that come spring we could clean the outside of the house easily. I had suggested borrowing my mom's (a three hour drive away) - and you can image where the conversation went from there. To sum it up - he is tired of me bringing up the credit card (yes, we have a balance again) every time he mentions wanting something. What I hear (which is not what he's actually saying) is that he wants to go out and buy something right now when he's really just making a statement of preference. So - we had a conversation about that. 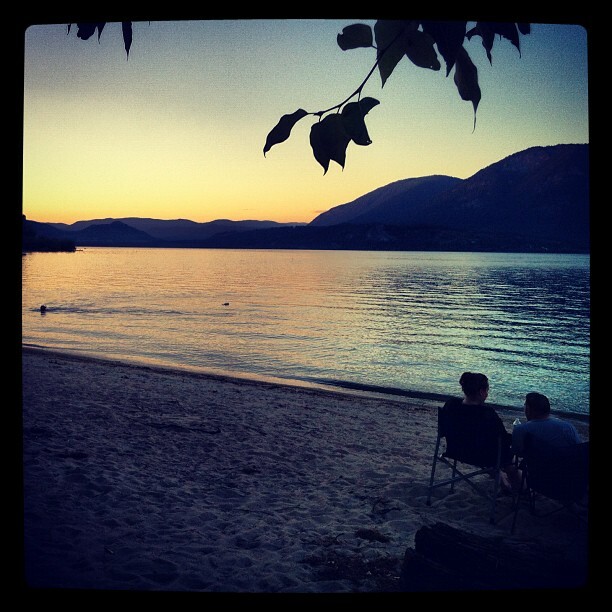 We both acknowledged that the place we're in now - is not the place we want to be financially. We looked at what we've tried - cash and credit - neither worked for us. Cash slips out of the fingers too quickly and credit...well it gets swiped to quickly. The thing that Jordan did like about cash was that ones it's gone - it's gone. That's it. So Jordan suggested that we explore using our debit card - though he knew that last time we did this I was frequently upset/agitated when trying to keep track of things. We chatted about why that was - we have so many ins and outs in our main account...every single bill we have is automated (except for the credit card) - and using the debit freaks me out! What if spend money that is allocated for a bill. What if something bounces? No way! I'm not sure who's idea it was, and it really doesn't matter, but we've come up with a new plan...a better plan. Once that we came up with together and we think it will work! Stop Using Credit Cards - cut them up if we have too. We will deposit money into the new account, much like we do for our savings accounts on a regular basis that corresponds with our pay schedule. We will both have debit access and will use this account for groceries, gas, entertainment ect. Here's the beauty of it - if we run out, we run out and it's okay - because nothing that is automated will be tied to it - nothing will bounce. The credit card debt will stop increasing. It will go down. It has to. In the past, Jordan and I have typically either used our tax returns for short term gain (laptop) or credit card debt. This year, I'm please to share with you that we have deposited the $2,475 into our house fund - we're currently saving up to build our fence and deck in the summer. This deposit brings us up to nearly $3,500! It's that time of the month again...below is our monthly spend report for February. 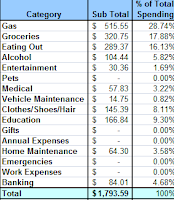 I've chosen to start including a percentage of total spending for interest. Our gas budget continues to trend high; however this month our grocery bill seems to have settled a bit. We ate out a tad more and drank a tad more - but still within fairly reasonable limits. Education had a bit of a bump because I had to pay my professional membership dues. February was our lowest spend month since September - so I'm really pleased with that. I feel like we're making some good progress to be careful with how quickly we whip out the credit card to pay for our day to day expenses. I don't live in British Columbia any more, but the majority of my family does and so I follow along with the news there. 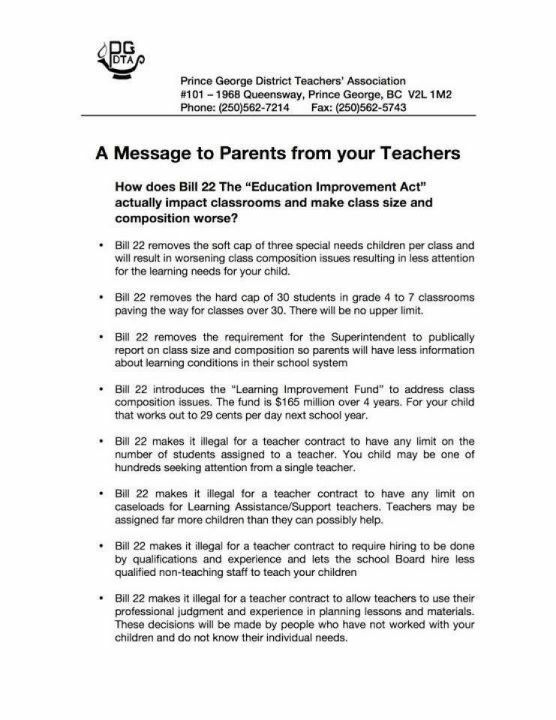 There is some pretty heavy stuff going on with the BC Government and their collective agreement negotiations (or lack there of) with the BC Teachers. I wanted to share with you all what's been going on in the news (if you aren't already following along yourselves) but then I came across an article that said it better then I think I ever could. I would really like to encourage you to read this - especially if your from Canada. This You Tube Video called Support BC Teachers explains what's going on from a student's perspective. ...and if you decide you would like to make a difference. 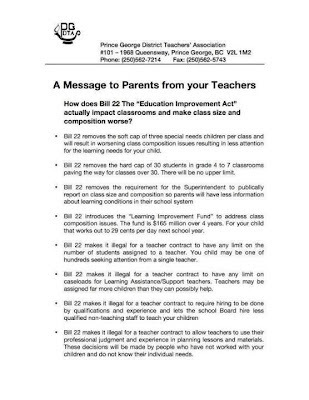 Please consider contacting your MLA (if your from BC), signing this petition (Kill Bill 22), or blogging, tweeting or Facebooking about this issue. Back in August, 2009 I wrote a post about the price of groceries in Calgary that referred back to some local consumer reporting on CTV. While it's hard to believe it was that long ago, our increased spending in groceries as of late had me reflecting on it. The comparison is done by a home economist as part of an ongoing series on price checks. Once a month, CTV creates a grocery list (which seems to average about 40 items) and compares prices at major Calgary stores. If a store has a particular coupon or sale, that is included in the calculation of the prices. Here is my summary of their reports for the last twelve months, I've highlighted the maximums for each month as that seems to fluctuate. The minimum cost for the same groceries, is always at Superstore - a constant from 2009. The last time I had a look at this, Safeway seemed to be a bit better priced then it is now - it is tied for second with Co-Op in terms of how often they are the most expensive. Another big change is that Co-Op has become more market competitive, it is no longer the most expensive grocery store in the report. Sobeys now takes on that honor. Jordan and I shop primarily at Safeway - so 3/12, we're choosing the most expensive place. Now that we moved, the closest store is actually the Superstore. It's somewhere where I beleive you have to be careful, because you can buy a lot more than just groceries, but it might be worth trying to focus our grocery shopping their to reap some savings. 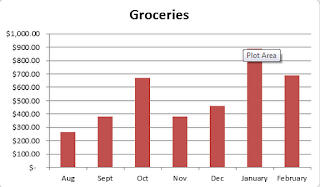 Here is a breakdown of our grocery spending for the last 7 months. In November and December, we were preparing to move, and eating out pantry - in January and February, we've been re-stocking that pantry. Over the next couple of months we'll be watching this category pretty closely to try to get it back down a ways. 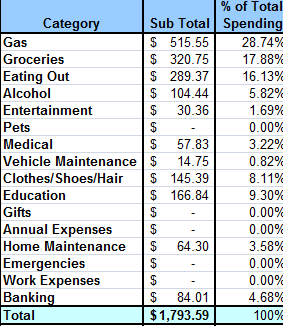 How much do you folks spend on your groceries, and how big is your family? I'd love to know what stores you shop at too. One of the things on our list while visiting mom was to have a look at her phone/internet/cable pricing. She lives in a pretty rural area, so has has to have two different companies. While surfing the companies website we found that they had an online chat feature with customer service. I hopped on, and pretended to be my mom. Within about 10 minutes I got my mom a pretty decent discount on her cable and internet services. Next up...the phone company. You have been connected to Ryan. Ryan: Thank you for contacting Phone Company Name, my name is Ryan, and I will be assisting you today, how may I help you? Jessie’s Mom: is there anything you can do to be competitive with them? Ryan: I am sorry, however we do not currently have any promotions that I can update to your account for you. Jessie’s Mom: So, you would rather I cancel and move all services to A Different Phone Company Name? Ryan: If you would like I can get you in contact with our Resolve department to speak about the possibility of cancelling and look into further options for you. Ryan has left the session. Please wait while we find an agent from the Resolve department to assist you. You have been connected to Andrew. Andrew: hello, I will do my best to help you out. Andrew: no problem. please give me a few seconds, and I will access your acct so to see what i can do. Andrew: you currently have a watch and surf bundle with us, and you pay $90.10/mth ... is this correct? Andrew: i see. i checked your bill, and the services are $90.10 (plus tax), but what i can do is add a loyalty discount (of 20%) lowering your bill, before taxes, to $72.08/mth (plus tax), if you're interested. Andrew: that's a monthly savings of $18.02, and i can do this for the next 12 months - an overall savings of $216.24. Andrew: would you like me to add this to your account? Andrew: just give me one minute, and i'll make sure it gets done for you. Andrew: it's complete. you're future bills will be $72.08 ($80.73 - taxes in). Andrew: is there anything further i can help you with? Andrew: it was my pleasure, thank you for contacting Phone Company Name.